Arsenal forward Alexandre Lacazette had a controversial goal disallowed late into Arsenal and Manchester United’s 2-2 draw this evening. In the 88th minute of the tie Lacazette was cheeky enough to head the ball out of De Gea’s hands as the Spaniard prepared to kick the ball away. Lacazette then latched onto the loose ball and fired the ball into the back of the net. 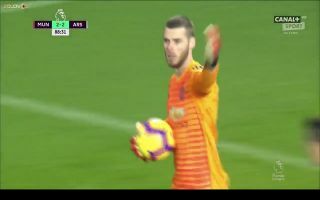 The Frenchman thought that he had given the Gunners the lead but the referee disallowed the goal citing the fact that De Gea still has control of the ball whether he holds it with one or two hands. Do you think the goal should have been given?